Mounted on walls or ceilings, our modular system is customizable to create a plethora of design configurations. The overall dimensions can be modified from square tiles to longer panels. LUMES panels range in lengths of 249mm increments, to suit different surface areas and fit within wall to ceiling restrictions. 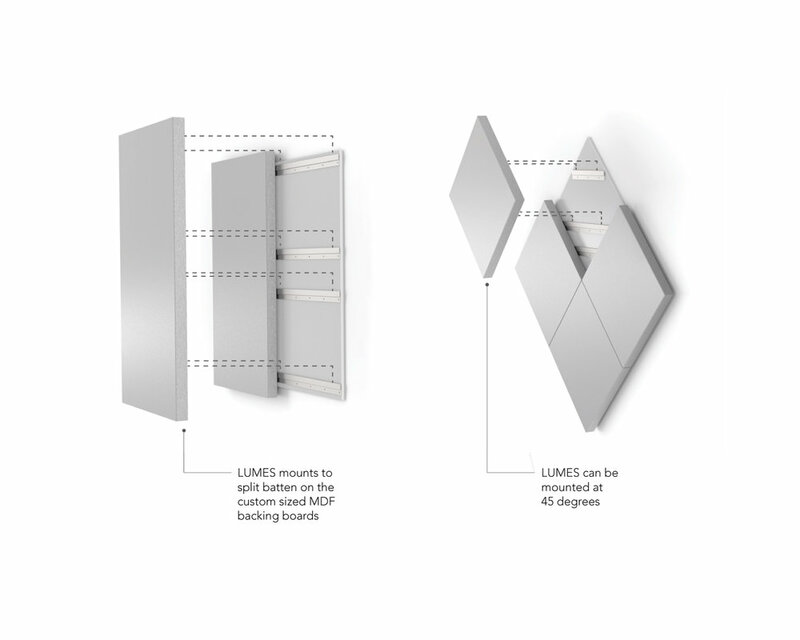 LUMES modular units, link together to form various configurations. The flexibility to be scaled up and down, to be shaped and formed to fit different spaces and surface areas. LUMES can be used to create different patterns and styles to suit and blend harmoniously into the surrounding environments. LUMES can be mounted onto most existing wall surfaces and can also be recessed into walls. Customised backing boards are designed as per project, to ensure a seamless integration with the wall. A split batten system is fitted to the backing boards for mounting the tiles. Our simple mounting system makes the panels easy to install, remove and replace for easy maintenance. Controller and Power supply boxes can be concealed within the walls or ceilings and the cables chased into the wall.